It’s a rare type of person who is never tempted by junk food. For the vast majority of people, temptation to eat junk food is something which occurs on a regular basis, whether it’s looking at TV adverts, passing your favorite restaurant or watching your friends order a calorie-loaded meal. Thankfully, there are some things you can do in order to not only resist the temptation, but reduce it altogether so you don’t have to feel tempted by it in the first place. If it’s in the refrigerator or the cupboards, the temptation to eat it is already much higher. When you go shopping for food, avoid buying junk food. Eat a meal before you go food shopping so that you don’t feel hungry during the shopping trip. If you’re hungry, you’re much more likely to buy unhealthy foods that you’ll regret later. This is particularly important if you regularly eat out with your friends or go to their houses for food. Let them know that you’re trying to eat healthier, and ask them not to tempt you with junk food. People tend to eat worse when they’re with other people and everybody else is choosing unhealthy options. The initial first stages are difficult to get through, but the less junk food you eat, the less your body will crave it. Soon, you’ll be looking at junk food and feeling disgusted at the thought of putting it into your body. When you start finding out what’s inside some of the unhealthiest foods on the market, you won’t even want to eat it, no matter how good it tastes. Watch videos of how food from fast food chains like McDonald’s are made, and it’ll put you off it for a very long time! 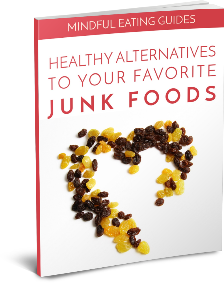 Avoiding junk food doesn’t mean you have to miss out on everything. You can still meet your friends for coffee, but order a skinny latte or green tea instead of the usual calorie-filled frappe or milky drink. Meet at a restaurant, but order a salad or light version of your usual favorites. Let yourself have a small amount of what you’re craving, since this will help you to stay on track more easily. You don’t have to completely ban yourself from junk food, since the feeling of not being allowed something can often make us want it even more.